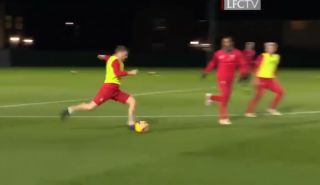 Liverpool midfielder James Milner showed he’s ready for the return of Premier League action with a superb training ground strike. The former England international shared this clip on his official Twitter page, clearly proud of the thunderous strike. While it’s only training, fans will no doubt be glad to see Milner looking sharp ahead of the return of club football. Others will just be glad of the reminder that the international break is finally nearly over! In fairness, England winning helps these weeks pass a bit quicker, but it’s just not the same as the Premier League, the Champions League and all the drama that comes with club football.